Salted citrus an easy way to have that fresh flavor on hand for cooking all year long. Try salted lemons, tangerines, and salt preserved oranges to keep a variety of flavors on hand. Early in the year, our local citrus trees are bursting with fruit. Wanting to preserve some of that goodness, I decided to try salted citrus. Well, it worked. Because guess what? 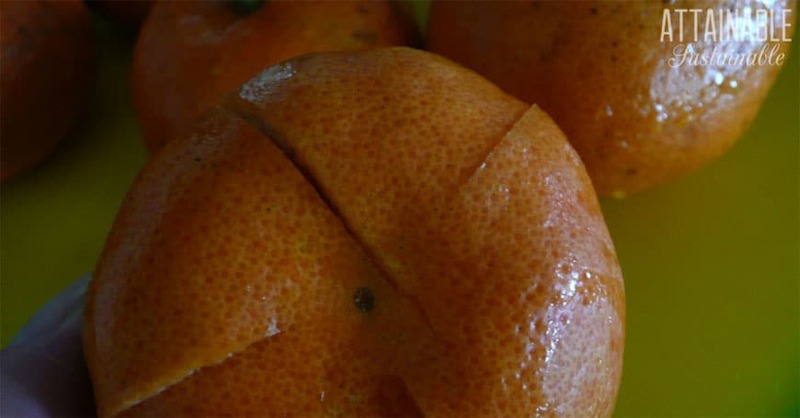 One* of the tangerines in the image below is two years old. Isn’t that wild?? Let’s be clear – preserved lemons and other salted citrus is not for eating out of hand. The preserved fruit is incredibly salty and best reserved for cooking. But people. 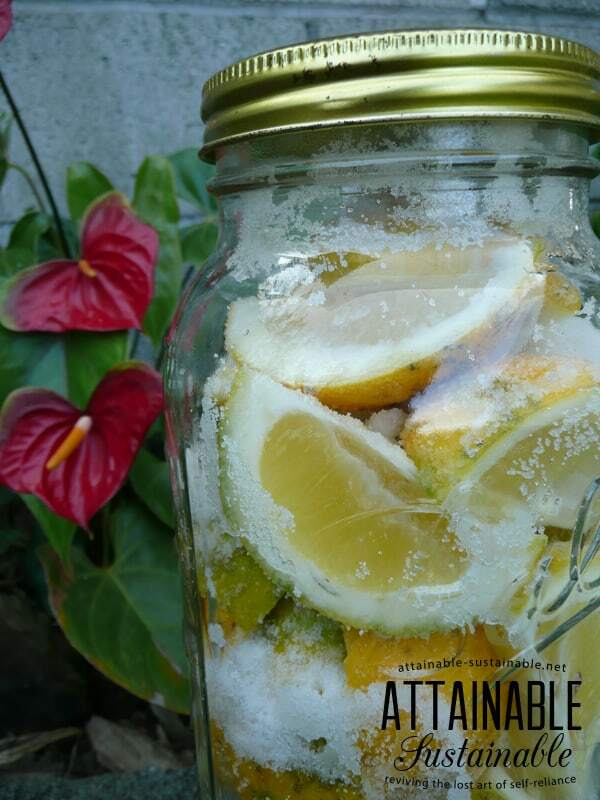 This is a super easy way to preserve citrus of any kind. 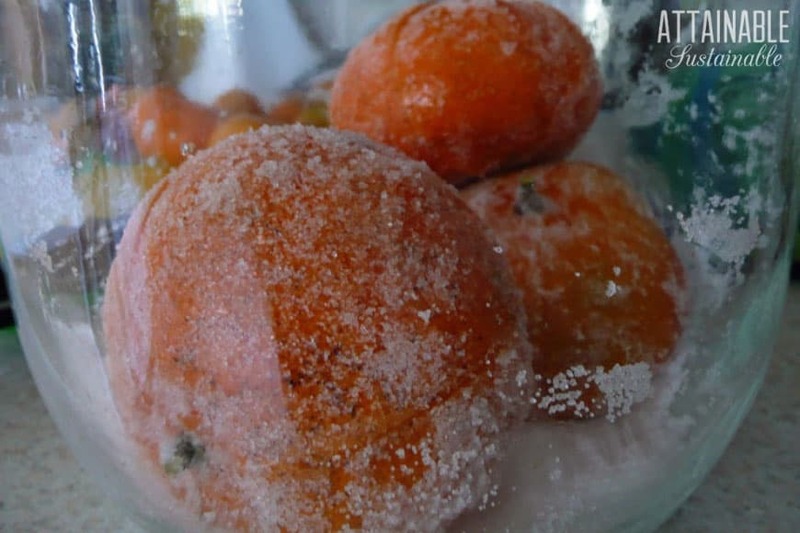 Salted lemons and salted tangerines will keep for years at room temperature. 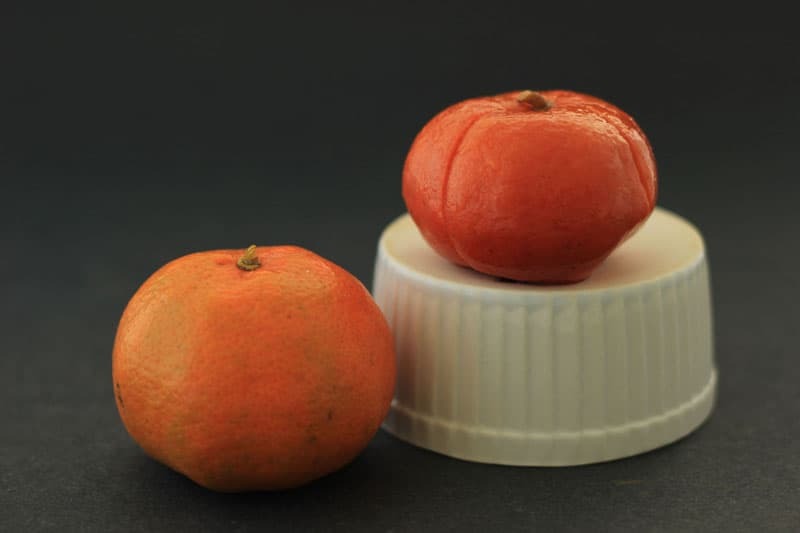 While my salted lemons and tangerines remained very true to color for the first couple of years, it’s actually quite common for the fruit to turn brown as they age further. Some people even put their jars of fruit out in the sun to hurry the preservation process; that seems to contribute to the browning of the fruit. One lesson I learned the hard way: Don’t use one of your nice jars. The combination of salt, moisture, and time will cause the lid to rust. 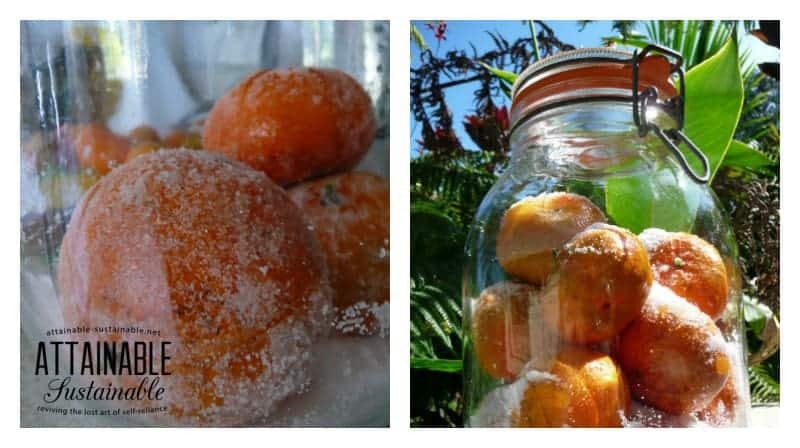 Opt for a recycled jar that you won’t mind getting rid of once your batch of preserved oranges is used up. 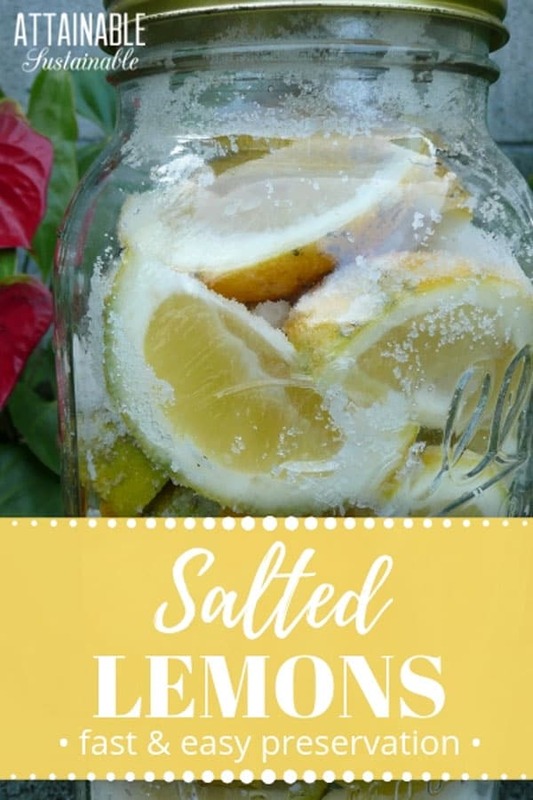 Add to salted lemons to marinades and salad dressings. Stuff preserved oranges inside a chicken before you roast it. Chop salted lemons or limes into salsa or chutney. 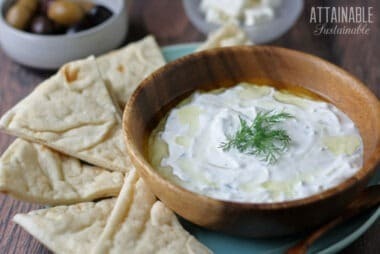 Use in Moroccan dishes like this tagine or this adaptation. Chop finely and add to a pasta dish or couscous. *If you haven’t figured it out already, the two-year-old salted tangerine in the top image is on the right. ★ Did you make this recipe for preserved citrus? Don’t forget to give it a star rating below! Let's be clear - salted citrus is not for eating. These preserved oranges, lemons, and tangerines are incredibly salty and best reserved for cooking. Enough citrus to fill a gallon sized jar tangerine, lemon, orange, grapefruit - whatever you like! Make four equally spaced, vertical cuts almost to the center of the fruit. You want the core to hold the fruit together, but the deep cuts allow salt to enter the fruit. Or you could simply quarter the fruit. 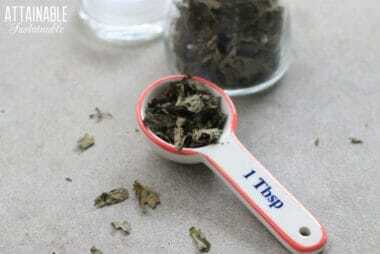 Sprinkle a layer of salt on the bottom of your jar. Set a layer of fruit on top of the salt and shake around a bit. Continue alternating layers and shaking until the jar is full. Make sure that the fruit is well-coated with salt. Secure lid in place and set in an out of the way spot. The fruit will begin to release juice; occasionally turn the jar over and back gently, just to redistribute the salt and juices. Set aside for a couple of months. Or years. What can you make with salted citrus? We’ve used salt-preserved lemons in stews, and it’s really good steamed with rice. I also like to use the salt while cooking. Great article! doubtful you could use it for anything really. I adore lemons preserved this way. They are great when you have a sore throat. I just eat them. Oh, now there’s a use I hadn’t thought of! Thanks! This is very interesting and applicable to me since we live in SoCal and it’s citrus time! Thanks for posting it. How do you know when it’s done curing? Do you need to set it out in the sun, or can you just wait until the salt and citrus juice incorporates and it looks like your final picture? Well, two years is certainly not necessary! I’d give it a month or two. And no need to set out in sun – I’ve stored mine in a cupboard. Pickled lemons, introduced in Morocco, I believe, have been around for ages. Kris, I love this. I have had two failed attempts at preserving lemons. In both cases the fruit started molding at the top of the liquid. Now I see my problem. I was trying to do it like pickles and I didn’t have enough salt. Yay! I think I can do this now. Thanks so much. Shared! I was pretty blown away with HOW well preserved these end up! 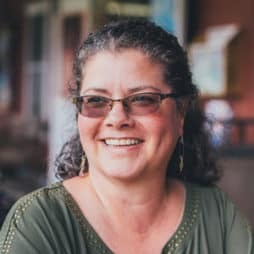 You can purchase plastic lids for your canning jars. This solves the rusting issue. In India we pickle lemons this way. Red chilli pwd ,ginger,n Garam masala( a combination of hot spices) r added to it.It is served with food. Do you use the peels or just the fruit? The peels, too, unless you don’t like them. This is GREAT! I don’t have citrus trees, but when the citrus is on sale, I can now buy with reckless abandon. Lol! We cook with citrus all the time. Thanks so much for sharing this! I like to chop these into pasta salad.